Palestinian terrorist asked for water, then shot his victims at point-blank range when they stopped to help. One person has been killed and another wounded, in a shooting attack close to the town of Dolev in the Binyamin region, north of Jerusalem. Paramedics and a large team of IDF security forces - including at least one military helicopter - arrived at the scene after responding to reports that terrorists had opened fire on an Israeli vehicle at 4:15 p.m. Friday afternoon. The fatally shot victim has been identified as a 25-year-old resident of central Israel. He was initially evacuated by helicopter from the scene and transferred to Tel Hashomer hospital unconscious and in critical condition, but succumbed to his injuries shortly afterwards. The second victim was evacuated by ambulance to Tel Hashomer, with gunshot wounds to his limbs; his condition is light-to-moderate condition. 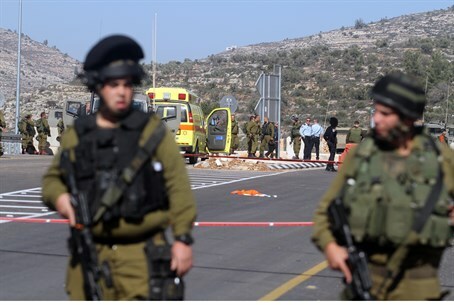 According investigators, the two victims were finishing a trip to a nearby spring and had begun leaving when a Palestinian standing at the side of the road waved them down, apparently asking for help. MK Motti Yogev (Jewish Home), a resident of Dolev and Colonel in the IDF reserves, arrived at the site of the attack shortly after to help emergency services evacuate the victims and secure the area. His son Yosef captured the scene, pictured below. "The security forces must speedily reach the terrorist (responsible)," Yogev said, claiming the attacker had fled to a nearby village. "Unfortunately, our Arab neighbors celebrate their festivals by killing, so it is therefore clear who this land belongs to and who must protect it," he said, referring to the fact that the attack occurred at the start of the Muslim holy month of Ramadan. It is believed an Arab sniper targeted the victims; one is in critical condition, while the other it described in light-to-moderate condition.